Garden hoses are the devil. They lay there, quietly baking in the hot summer sun, just waiting for some dumb schmuck to come along and try to take a sip—then BAM! A faceful of scalding hot water. However, this painful phenomenon is not without benefits—hoses turn into miniature geysers thanks to solar thermal energy (STE), one of the oldest and greenest renewable energy sources known to man. Unlike photovoltaic technology, STE harnesses the sun's rays to generate heat rather than electricity. In residential use, STE usually boosts the efficiency of water heaters, heat pumps, and absorption chillers. In large-scale installations, it can be used to generate electricity. Here's how it works. The use of STE dates back hundreds of years. In 1760, Swiss naturalist Horace de Saussure devised a solar oven built out of a half-inch tall pine box, topped with glass pane. Placed in sunshine, the glass pane and enclosed area worked in tandem to concentrate incoming solar energy and prevent its escape (aka the greenhouse effect). It was effective enough to boil water to a temperature of 228 degrees F. "It is a known fact," Saussure said, "that a room, a carriage, or any other place is hotter when the rays of the sun pass through glass." STE-harnessing technology continued to develop into the 20th century when, in 1881, Charles Kemp patented the first passive solar water heater, today known as "batch water heaters," and sold them as the Climax System. To make domestic hot water, it used a trio of water tanks set in a sunny greenhouse on the south wall of a home. In 1909, William Bailey improved upon this design by separating the heating element—panels filled with copper water pipes—from the storage tanks. This allowed the system to continuously heat larger quantities of water for a houshold throughout the day. Bailey sold 4,000 of his Day and Night Solar Hot Water Heaters over the next nine years. But an adundance of cheap fossil fuels was already reducing the demand for this technology. Reducing—but not eliminating. Even as the world economy exploded with the advent of the internal combustion engine, STE technology continued to evolve. Today, low-temperatue collectors make up a vast majority of STE technology in America. These systems, commonly used to heat pools, operate at or below the surrounding air temperature. They're basic: A black plastic mat, placed over the pool, transfers the sun's energy into the pool and holds the heat in the water. Medium-temperature collectors, which operate at temperatures significantly higher than the ambient air, have also found a niche heating homes and businesses. Solar water heating, like Kemp's Climax, uses solar water panels to continually heat a large supply of water. They can be passive, like Kemp's, but can also be pump-driven, active systems. Systems like these can provide domestic hot water, or they can be used with heat pumps to efficiently heat and cool entire houses. Some of the more creative new applications of these systems can be seen at the biennial Solar Decathlon competition, a contest among college students to design and build a home that achieves net-zero energy consumption. High-temperature collectors are another beast entirely. These systems are used exclusively in energy production. They occupy square miles of land, and reach temperatures into the thousands of degrees. The solar furnace at Odeillo in the French Pyrenees-Orientales tops out at nearly 3,800 degrees Celsius. 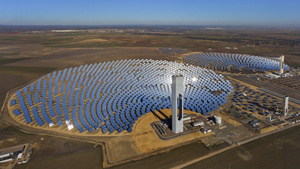 These plants rely on a huge number of reflective collection plates, which can be flat, trough, or parabolically-shaped, to concentrate the Sun's rays on a single point to super-heat a fluid—like synthetic oil, molten salt or pressurized steam—which then drives a Sterling, steam, or gas turbine engine. Unfortunately, as much as 70 percent of this heat is lost before it can be put to work by the engine. The US built nine such power plants, between 1984 and 1991, in the Mojave Desert in California. Still in operation today, they together produce about 354 megawatts annually, enough to power a half million homes. Sandia National Labs also runs a solar farm just outside of Albuquerque, NM. The only testing facility of its kind in the US, the Solar Thermal Test Facility at Sandia National Laboratories can focus six, 38-foot-wide parabolas, each comprised of 82 mirrors, at a seven-inch wide target and heat it to over 650 degrees C. "That'll melt almost anything known to man," Sandia engineer Chuck Andraka told Popular Mechanics. "It's incredibly hot." While such solar farms take up a large amount of space, they have the capability to deliver an equally large amount of energy. 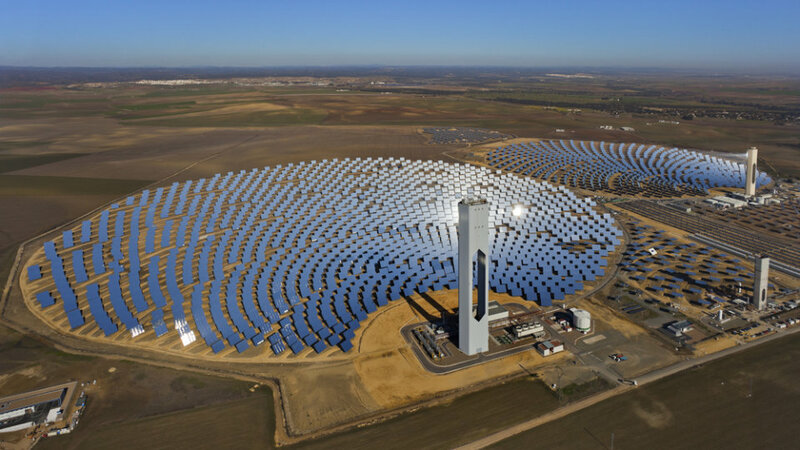 Industry experts like Fred Morse, a senior advisor to Spanish power utility, Abengoa, believe that were the Southwest's 87,000 square miles of open, flat, and sunny land were used for a solar farming, it alone would generate 11,200 gigawatts of power. But the current, reasonable estimates put the total installed STE-collection base at just 35 gigawatts by 2020. Still, the entire country generated 1,138 gigawatts in 2010. Even that lower estimate significantly alter the amount of electricity generated by renewable sources.